On the Menu…Live! 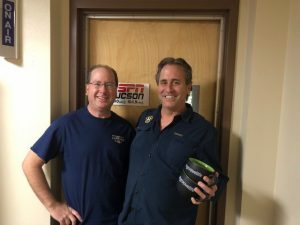 » Tales of the Keg on ESPN Tucson: Barrio Brewing Co.
Tales of the Keg on ESPN Tucson: Barrio Brewing Co. In this edition of Tales of the Keg on ESPN, I caught up with Dennis Arnold of Barrio Brewing Company, the oldest craft brewery in the state of Arizona. He had some sudsy stories to tell including a new commemorative beer to celebrate the NOVA Home Loans Arizona Bowl! « Our (for now) finale!